The concept: To obtain a two dimensional depth-time data record for your time-series sensors. With the Wirewalker™, the traditional vertical chain of expensive instruments is replaced with a single sensor that is rapidly profiled. The Wirewalker™ harnesses the power of ocean waves for rapid propulsion, yet it produces measurements that are completely decoupled from the vertical motion of the sea-surface, enabling the collection of extremely high-quality data. Here’s how it works: A length of wire is suspended from a small surface float. At the deep end of the wire a weight encourages the entire length of wire to move vertically, following the oscillatory motion of the surface float. The Wirewalker™ profiler rides along the wire, with an internal cam grabbing the wire when it descends and releasing when the wire ascends. At the bottom of the desired profiling range, the profiler collides with a mechanical “stop” which releases the cam, enabling the Wirewalker™ to free-ascend to the top of the wire under its own buoyancy. Here, the cam is reset and the cycle repeats. Typical profiling speeds are of order 10 m/minute, round-trip, through a wide range of sea states. So What? The Wirewalker™ differs from most buoyancy or motor-driven profilers in that it can either be moored to the sea-floor or drift free with the currents (Lagrangian). It can profile to within a meter of the sea surface in “undisturbed” water. Internally-recording, self-powered instruments are “interfaced” simply by bolting them to the Wirewalker™ and adjusting the floatation. Ballasting need not be as precise as with buoyancy-driven profilers. Just add pre-cut blocks of foam until the Wirewalker™ floats upward at about 0.5 m/s and you’re good to go. No Batteries Are Harmed in the Making of These Profiles. The Wirewalker™ is designed to be simple in operation, robust to challenging conditions, and highly use-configurable. By transforming energy from the surface wave field to vehicle profiling motion, on-board batteries are used exclusively to power instrumentation. From conductivity, temperature and pressure observations, to optical, ocean-current, and turbulence measurements, the smooth free-ascent of the Wirewalker™ allows for the collection of high quality data from any fast-sampling oceanographic sensor. The continuous profiling afforded by wave-energy enables the monitoring of rapidly-evolving, small-scale phenomena. The endurance afforded by wave-energy enables the big picture to be obtained as well. Proven Performance: From the Southern Ocean to Lake Superior, the Wirewalker™ has proven to be a global workhorse. Deployments have ranged from open ocean, free-drifting stations (1-500 meters every 50 minutes) to inner-shelf moorings just seaward of the surf zone (1-10 m profiled forty-thousand times per month). Over the past decade Wirewalkers have made over 500,000 profiles spanning more than 18,000 km of vertical distance, all powered by surface waves. 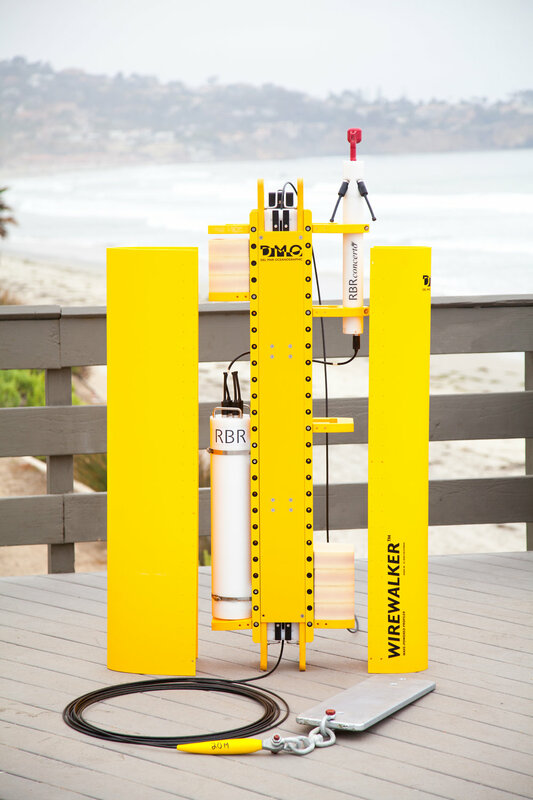 Proven Pedigree: The Wirewalker™ was developed by the Ocean Physics Group, Scripps Institution of Oceanography, La Jolla CA. under sponsorship from the Office of Naval Research and National Science Foundation. After extended development it is now produced commercially by Del Mar Oceanographic under exclusive license from the University of California. Wirewalker™ is a beneficiary of the Technology Transfer Programs of NSF, ONR and UCSD.